This is an alarming discovery done by Felix, all your private moments, perhaps you in bathroom, your mobile phone information is just not private anymore, if you grant camera access to the third party apps. The worst part is, there is no notification on mobile, no light or any kind of indication that you are being recorded. His main goal is to highlight a privacy loophole that can be abused by third party iOS apps. Apple users often allow camera access permission to a third party app after the download so they can (take pictures, add avatars and stickers over the pictures), these apps can track the user space take pictures and record videos using the front and back camera without notifying. Well, here is one easy protection measure you can take in order to avoid these third party apps taking your pictures and videos. Put sticker or tape on your front and back camera. Remember viral picture on social media of Mark Zuckerberg using his laptop with tape on the webcam?. This is the most effective way of protecting yourself from being recorded all the time. When you want to take pictures or record a video, you can remove the tape. 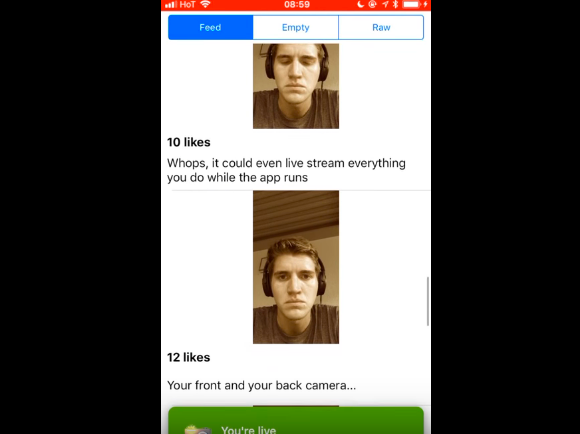 In this video, Felix demonstrates how vulnerable you can get if you allow camera access to the third party apps. This report comes in at a very interesting time when apple launches iPhoneX on 3rd November. Felix says that all the report in his blog is done as a hobby which he works over the weekend and is by no means to be associated with his employer Google.